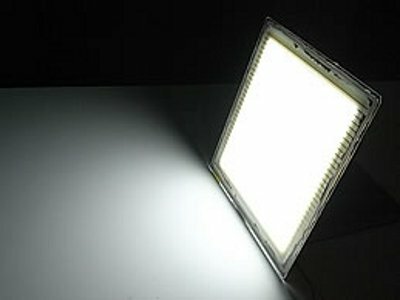 Japan-based Ason Technology unveiled their first OLED lighting panel in 2013, and last year we featured an article discussing the company's technology and business. In a recent interview to Sangyo-Times, the company's CEO reveals some interesting updates. Ason spent almost eight years to develop a new multi-stack structure that can be used to create OLED with many layers, which results in long-lasting high-brightness panels. The company now reports that it developed an OLED with twelve (!) emitting layers, which enables it to reach a high brightness of 50,000 cd/m2. Ason does not reveal the lifetime of this panel at high brightness, but they say that at 5,000 cd/m2, it can last for 50,000 hours (probably LT70). This panel is all-fluorescent, and Ason still considers changing to phosphorescent materials to increase lifetime and efficiency. Ason currently has a small pilot production line, with a annual capacity of a few thousand panels (at 72x72 mm). While the company first planned to operate in a fabless model (outsource commercial production), it seems that they decided to start production in house. They are working to raise 800 million yen ($6.7 million) to build a mass production fab in Japan that will be able to produce 350,000 20x20 cm panels annually. If all goes according to plan, production at that fab will begin in the Spring of 2016. Ason is also considering to build a factory in China, or perhaps in Taiwan and in Korea. The company is in talks with other companies to cooperate on this fab, but the plan is to sell the panels under the Ason OLED brand. Ason currently focuses on selling their panels to medical facilities, museums, studios and stages. Ason says that currently their panels cost about 40,000 yen ($336) for a 15x15 cm panel. But they expect prices to come down so they could compete in general lighting. The company is also in talks with Japanese and international car makers.